Canada, bucking an international trend that has seen central banks become net buyers of gold since 2010, has sold off all its official gold holdings. 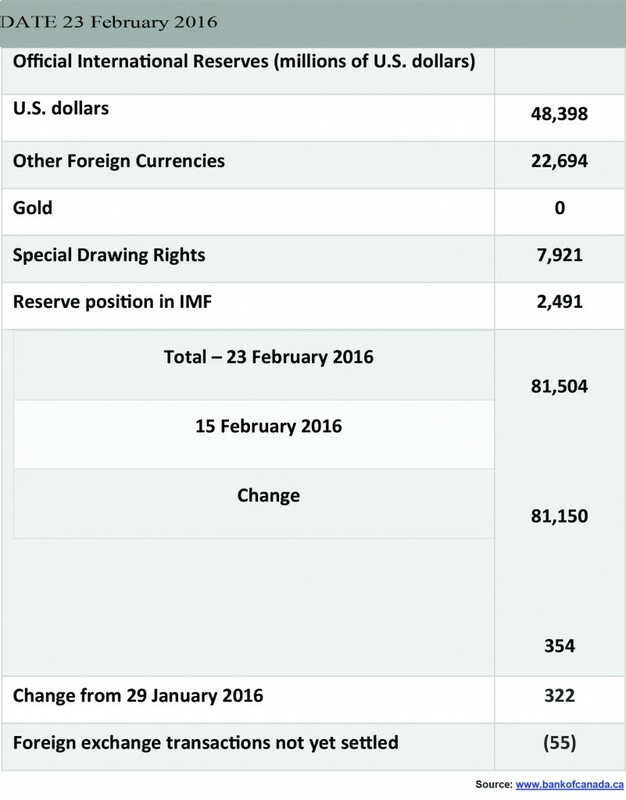 Canada’s official international reserves last released by the Bank of Canada (BofC) on February 23, 2016 showed gold reserves at zero (0). This is unprecedented. 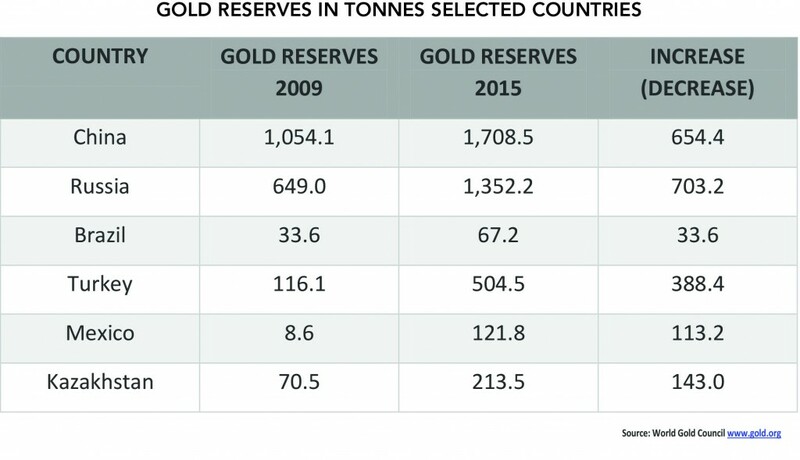 Canada now stands as the only G7 nation that does not hold at least 100 tonnes of gold in its official reserves. According to statistics from the World Gold Council (WGC), Canada’s current holdings would now rank it dead last out of 100 central banks, behind Albania at number 99. A footnote says that the BofC still holds 77 ounces of gold, primarily in gold coins. The weekly Reserves data will be posted on the Bank of Canada’s website on the first business day following the 8th, 15th and 23rd day of each month. The monthly Reserves data will be posted on the Department of Finance website on the third business day following month-end. Between 1999 and 2002 the United Kingdom, under the auspices of the Bank of England (BOE), sold roughly 395 tonnes of gold, representing over half of the UK’s gold positon. The UK pre-announced the sales, and held 17 auctions during the period. The era became known as “Brown’s Bottom,” named after Gordon Brown, the Chancellor of the Exchequer at the time. The immediate reaction was a 10% decline in the price of gold. Gold traded between US$253/ounce and US$350/ounce during the period, with the UK averaging roughly US$275 for its gold, and raising about US$3.5 billion (about £2.3 billion). Based on today’s prices of roughly US$1,270/ounce, the UK gold, if sold today, would be worth about US$16.1 billion (£11.3 billion). While gold prices are up 335% since 1999, the US dollar and the euro, the two prime currencies that the BOE would have substituted for its gold holdings, have declined in value. Will Canada’s sale of its gold become known as “Poloz’s Bottom,” named after BofC Governor Stephen Poloz? It’s possible, especially if gold was to rise sharply in the coming years, as it did following “Brown’s Bottom.” The UK’s reasoning for selling its gold at the time was that it wanted to diversify its assets away from gold, which was deemed to be too volatile. Brown’s action attracted a lot of criticism, and in order to deal with this sale a consortium of central banks, led by the European Central Bank (ECB) and the BOE, signed the Washington Agreement in September 1999, limiting gold sales to 400 tonnes per year for the next five years. That agreement was renewed in 2004, and again in 2009. Gold, however, is not a commodity – it is money itself, as it has been for over 3,000 years. It is traded daily on the currency desks of major banks around the world. That puts gold in the same category as the US dollar, the euro, and other currencies. The physical gold market is estimated to have an average daily turnover of upwards of US$24 billion daily in both cleared and uncleared OTC markets, according to statistics from the London Bullion Market Association (LBMA). This makes daily gold turnover trading in the London market on par with the major currencies, and larger than all bond markets, except for the US Treasury bond market and the Japanese government bond market. Gold trades in one of the most liquid markets in the world. Gold continues to remain an integral part of central bank reserves and the IMF’s Special Drawing Rights (SDRs), along with other currencies. Further, as a demonstration of gold’s liquidity, gold can be included in banks’ liquidity buffers under Basel III regulations. 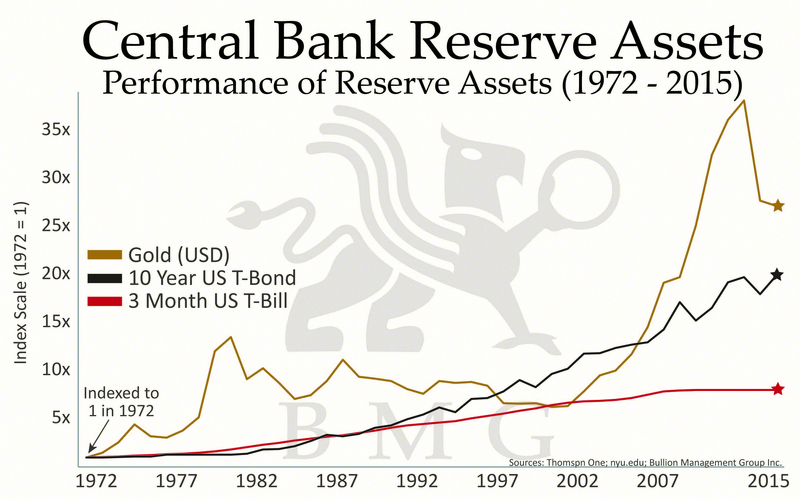 This is an important distinction, because it means private banks can hold gold as a reserve liquidity asset. 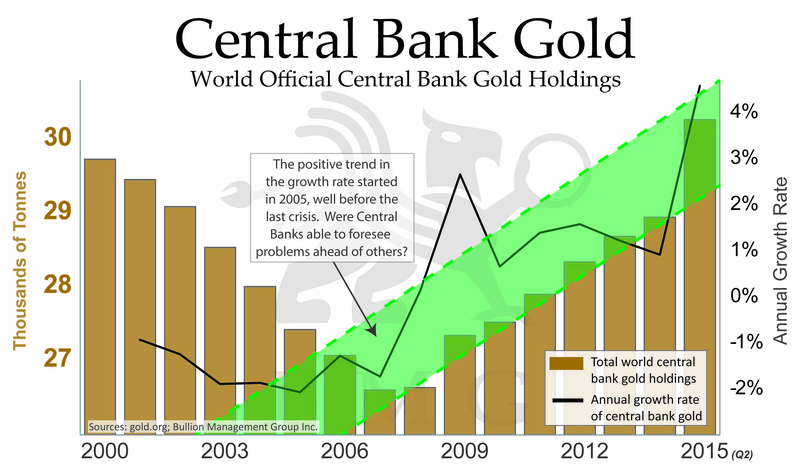 Central banks, according to statistics from the WGC, hold roughly 32,739 tonnes of gold, of which the IMF holds 2,814 tonnes as of February 2016. The largest reserves of gold remain in the US with the Federal Reserve (Fed), which holds 8,133.5 tonnes according to WGC’s statistics. Canada held some 1,023 tonnes in 1965. That was the zenith. By 1985 Canada’s holdings had fallen to 500 tonnes. Throughout the 1990s and up to 2002, Canada kept selling its gold. Canada has now reached its nadir in gold holdings. None. Another argument as to why it doesn’t make sense to hold gold came from Don Drummond, a former senior Finance Department economist and Chief Economist at Toronto-Dominion Bank. Mr. Drummond has stated that it didn’t make any sense to hold gold, because it hasn’t delivered a good rate of return over time and it costs money to store. While storage costs are a factor in holding gold, it should be noted that, since 2000, gold has outperformed numerous assets, returning 335% vs. 36% for the S&P 500, and 59% for the S&P TSX Composite. Since the world was taken off the gold standard in August 1971 by former US President Richard Nixon, gold has moved from US$35/ounce to about US$1,270/ounce today—a return of 3,528%. The Dow Jones Industrials (DJI) closed at 898 on August 31, 1971, and today sits at about 17,000 for a return of 1,793% before reinvestment of dividends. But stocks are not reserve assets. Central banks hold primarily US Treasuries. Today, US Treasuries make up about 60% of all reserve assets for most central banks. 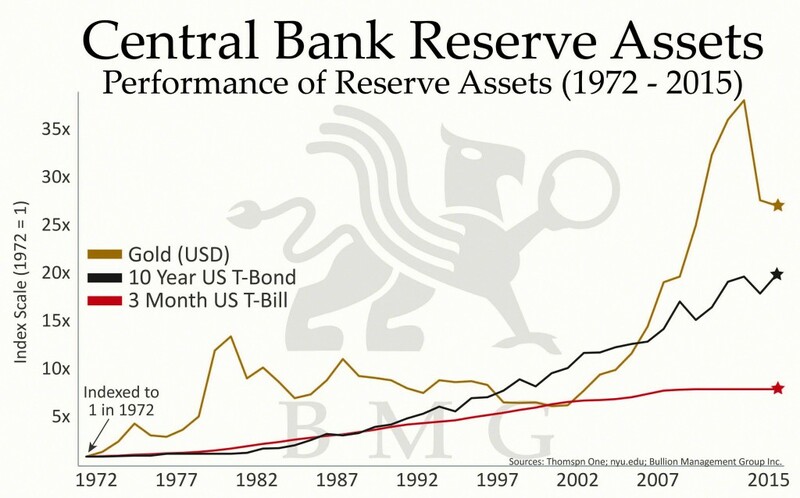 Prior to 1971, and under Bretton Woods, gold was the largest reserve asset holding. The chart above shows that gold has outperformed US Treasuries by a considerable margin. Greenspan may have been one of the most forward thinking of all Fed chairmen. He is still revered today. Since 2010 central banks have been net buyers of gold. In 2015 official purchases were 588 tonnes. 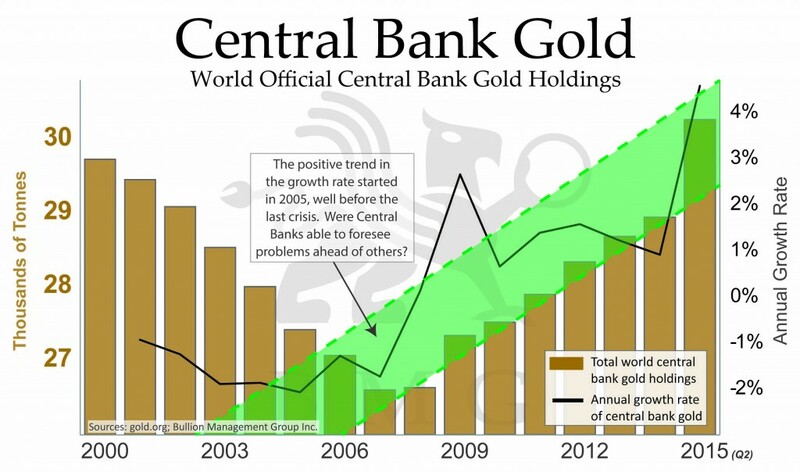 The prime buyers have been Russia and China, but other central banks have also purchased gold, as the chart illustrates. Gold purchases by central banks have moved from less than 2% of world demand for gold in 2009 to over 14% today. Central banks have purchased gold in order diversify their reserve portfolios, especially away from US dollar-denominated assets, with which gold has a strong negative correlation. 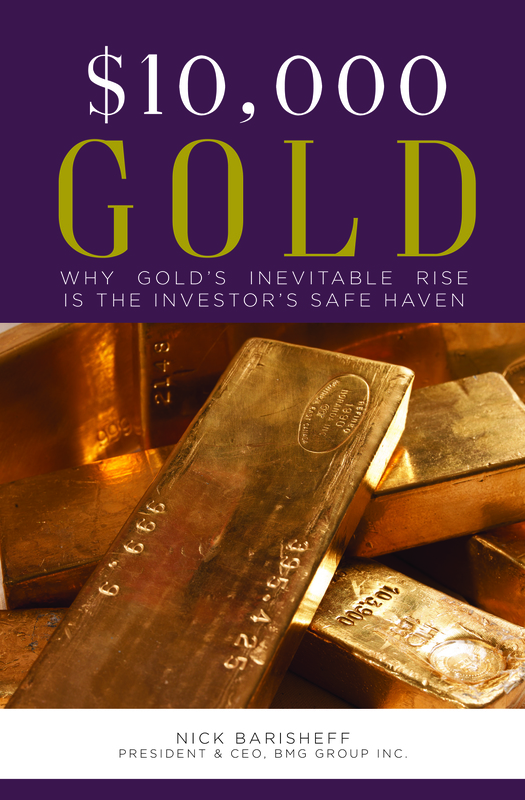 Others have purchased gold to hedge against tail risks, or because of inflation hedging characteristics, because gold has maintained its purchasing power over a long period of time. 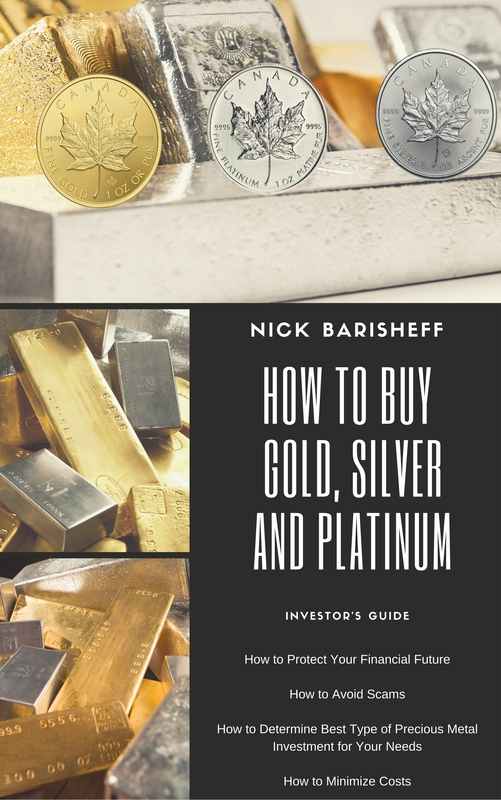 Gold plays a prominent part in reserve asset management, given that it is one of the few assets that is universally permitted by the investment guidelines of the world’s central banks. Central banks of the world appreciate the size and liquidity of the global gold market, and that it remains that way even through periods of uncertainty. Out of 188 member countries of the IMF, 100 countries hold gold as part of their monetary assets. Canada is now among the 88 countries that have no gold, countries such as Angola, Belize and Tonga. Following five years of a downtrend, gold may now be in the early throes of new bull market. The current down market for gold got underway in September 2011, and has lasted 54 months. In terms of length it is one of the longest gold bear markets dating back to the 1970s. Gold currently remains down about 34% from the September 2011 high in US dollars, but is only down 11.6% in Canadian dollars. At the December 2015 low, gold was down 45% in US dollar terms from the 2011 high. Gold in Canadian dollars made its low in July 2013, and since then is up 35.5%. On average gold in US dollars has fallen 39% during previous corrections. Canada’s reserve position at the IMF is currently US$10,412 billion, including SDRs entitling Canada to 111,687 votes within the IMF, or 2.26% of the total. The US has the largest voting block, with 16.8% of the total. But this will change with the inclusion of the Chinese renminbi in SDRs, and each country’s entitlement to votes will also change. With Canada giving up its gold, as well as seeing its reserve position in the IMF, including SDRs, fall US$1.2 billion in the past year, Canada’s voting power and influence in the IMF is bound to fall further. Along with its largest voting block, the US also maintains a power of veto at the IMF. However, with the IMF’s inclusion of China and its contribution to SDRs in 2016, US voting power will fall and it could lose its power of veto. The US is resisting all attempts to change its current veto power and control at the IMF. Resistance to change by the US includes attempts to isolate China and Russia. The result has seen the BRICS countries (Brazil, Russia, India, China and South Africa) set up the New Development Bank (NDB), which could challenge the IMF. It is noteworthy that gold is to be a critical part of the NDB. While the world’s central banks continue to officially hold 32,739 tonnes of gold as reserves, leasing of gold by the central banks through the bullion banks got underway in the 1990s. Important questions have been raised as to what has happened to the leased gold. It is noteworthy that the Fed has refused all attempts to audit its gold since the early 1950s. At one point it was estimated that, because of leased gold, there was upwards of 16,000 tonnes of central bank gold sold short as a result of leased gold sales. 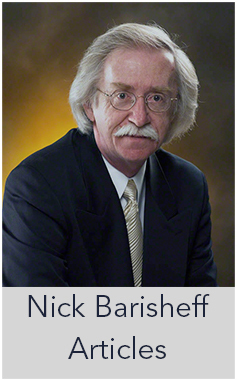 Sales of leased gold do not appear to show up in any annual statistics of supply and demand. However, it is known that annual leased gold is not zero, with estimates as high as 1,500 tonnes per annum. An inclusion of leased gold in the supply/demand statistics would imply an increase in central bank or investment demand in order to keep supply/demand balanced. Unlike the Western nations, China and Russia have been building up their gold reserves, even as China understates its current position of gold held by the People’s Bank of China (PBOC). Chinese gold has also been purchased through its sovereign wealth fund, which does not report its holdings, and will at some point be transferred to the PBOC. Meanwhile attempts by some Western banks, such as Germany’s, to repatriate their gold holdings held in foreign central banks, primarily in London and New York, have been met with stalling. Others, such as the Netherlands, have been successful in repatriating their gold. The unanswered question, however, is where is the gold? Despite all that, no central bank has openly admitted that it has sold all of its gold, as Canada has announced. For Canada, it is truly a case of “…and then there was none.” Canada will likely regret that decision at some point in the future. David Chapman is Chief Economist with Bullion Management Group Inc. He regularly writes articles of interest to the investing public. David has over 40 years of experiences as an authority on finance and investment, through his range of work experience and in-depth market knowledge. For more information on Bullion Management Group Inc., BMG BullionFund, BMG Gold BullionFund and BMG BullionBarsTM, visit www.bmgbullion.com, email info@bmgbullion.com, or call 1 888.474.1001. I would bet China has @20,000 tons of gold. Russia is now among the top five gold holders after surpassing China, which “reportedly” holds 1,843 tons. Over the last 15 years, Moscow and Beijing have been aggressively accumulating gold reserves to cut their dependence on the US dollar. So the Queen demanded British Canada turn all the gold over to her? Canada, bucking an international trend that has seen central banks become net buyers of gold since 2010, sold off all its official gold holdings. Canada’s official international reserves last released by the Bank of Canada (BofC) on February 23, 2016 showed gold reserves at zero (0). 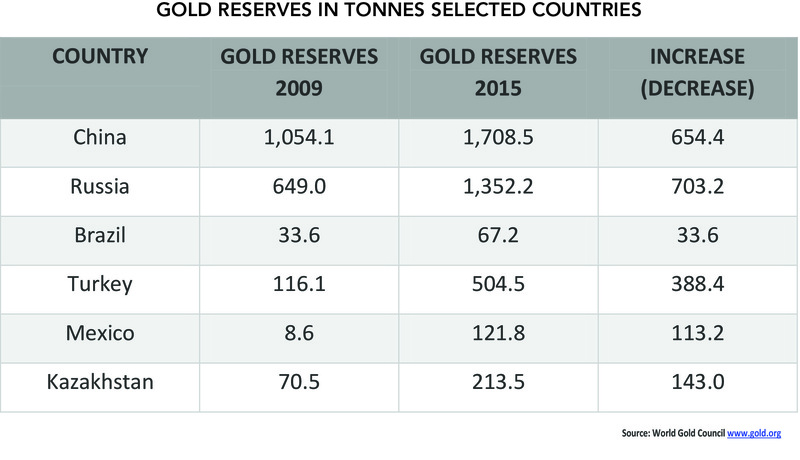 Canada now stands as the only G7 nation that does not hold at least 100 tonnes of gold in its official reserves. Canada held some 1,023 tonnes in 1965. That was the zenith. By 1985 Canada’s holdings had fallen to 500 tonnes. Throughout the 1990s and up to 2002, Canada kept selling its gold. Canada has now reached its nadir in gold holdings. None. Despite all that, no central bank has openly admitted that it has sold all of its gold, as Canada has announced. For Canada, it is truly a case of “…and then there was none.” Canada will likely regret that decision at some point in the future. THE QUESTION IS: “WHO BOUGHT CANADA’S GOLD RESERVES??????????????????????????????????? ??????????????????????????????????????????????????????????????????????????????????????????????????????????????????????????????????????????????????????????????????????????????????????????????????????????????????????????????????????????????????????????????????????????????????????????????????????????????????????????????????????????????????????????????????????????????????????????????????????????????????????????????????????????????????????????????????????????????????????????????????????????????????????????????????????????????????????????????????????????????????????????????????????????????????????????????????????????????????????????????????????????????????????????????????????????????????????????????????????????????????????????????????????????????????????????????????????????????????????????????????????????????????????????????????????????????????????????????????????????? ?………………………………….